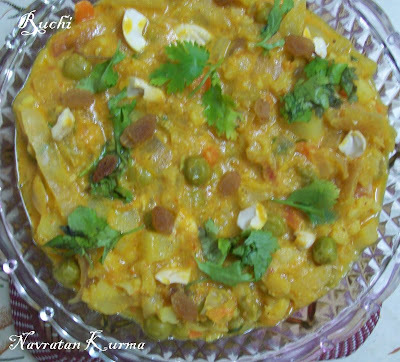 Navratan korma is popular Indian Vegetarian curry. This kurma is a mixed combination of vegetables, paneer, fruit & nuts. 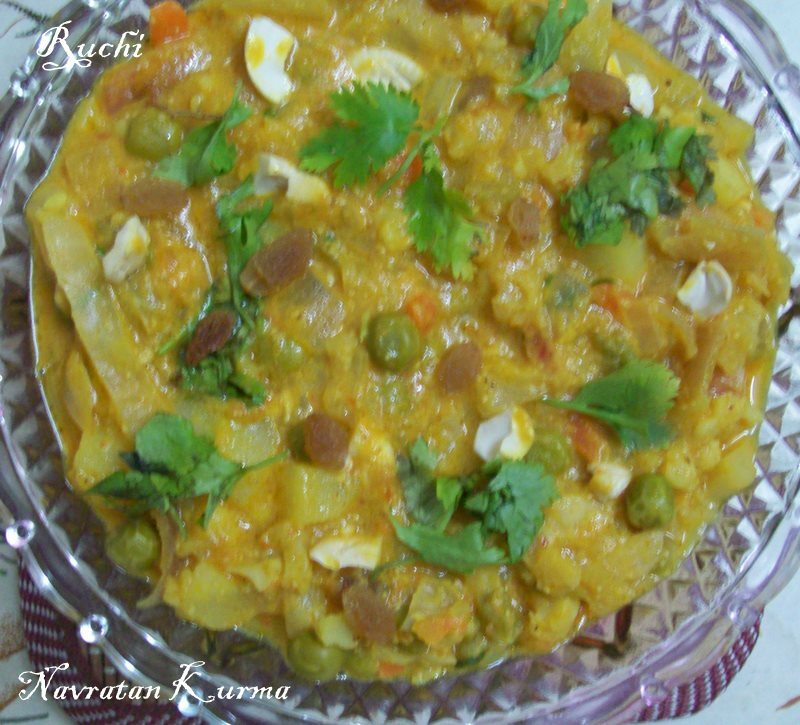 Traditionally Navratan Korma comes from a Mughlai origin giving it a very rich and slightly sweet taste. This is an absolutely delicious recipe and for all those who are not so fond of spicy Indian food, this should be a welcome change. 1.In small bowl soak cashew nut and poppy seeds in 1/4 cup warm water for 30 minutes. 2. Blend together cashew nuts, poppy seeds, ginger, green chili, clove and cinnamon, into smooth paste. 3. Make tomato puree. Ready-made tomato puree can also be used. 4. Take 1 tbsp ghee and increased dry fruits for about 1 minute on medium heat. 5. Heat oil in a saucepan. Fry the onions and ginger-garlic paste until golden brown. 6. Add salt, turmeric powder, red chilli powder, coriander powder, garam masala and cook for 2-3 minutes. 7. Next add tomato puree and dried fruit. Stir well and cook the mixture for 4 minutes. Make sure the mixture does not stick to the bottom of the pan. 9. Add paneer to the sauce and stir well. 10.Finally, add all the vegetables to the above gravy and cook for 5-7 minutes. 11.Garnish with chopped cilantro and serve hot with roti, chappati, paratha or rice. 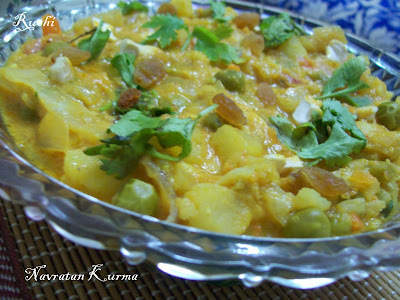 Looks super delicious and wonderful..
Popular & one of my most fav curries!! !